New Dow (DJIA) closing high of 15,680 illustrates that the fundamentals as perceived by academic economists, pseudo-economists (Journalists) and market commentators (sales men) which suggested that following the last stock market peak of Mid September, and in the light of dire news of U.S. government shutdown, possible debt default, QE tapering and slowing econcomy that the stock market looked set to have entered into another New bear market. The calls for such dire expectations reached their maximum intensity at the depths of the stock market correction by early October where many commentators in the mainstream press and BlogosFear could be found proclaiming that "The Top Was In", "The Top Was In", and continuing along a now very familiar argument for a debt deflationary death spiral, an argument that is more than 5 years and has YET to materialise whilst 'normal' and seasonally expected stock market corrections have ALWAYS resolved to new all time highs, just as was the case this time around. Luckily for the perma-fools, I don't see it as my job to hold the fools to account for that is first task of every reader to use the most powerful tool at their disposal, even more powerful than the NSA! It's called GOOGLE! a Quick google will soon reveal that truth of the delusional state of mind that resembles that of being mentally ill of those that purport to commentate on the markets. I say delusional and even mentally ill because they have a clear psychological block that prevents them remembering what they stated barely a few days earlier, such condition prevents such commentators from learning from their mistakes and can thus be found regurgitating the same deflationary scenario for in some cases even decades! As I have covered many times over the years, it is not of much value to explain why something has already happened, because any event could be used to explain a rise or a fall in market prices. For instance today the perma- fools (journalists) can be found explaining the rise in the stock market to a new all time high as being as a consequence of a weakness in US consumer confidence and thus implies a delay in Fed QE tapering, whereas had the stock market fallen then the same data would have been used to explain its fall. This illustrates why most investors miss whole bull and bear markets, it is because they are paying attention to those that don't even trade! The smartly dressed idiots reading off autocue's, written by journalists, managed by senior journalists none of whom have ever traded and if they had they FAILED because that's why they ended up where they are. 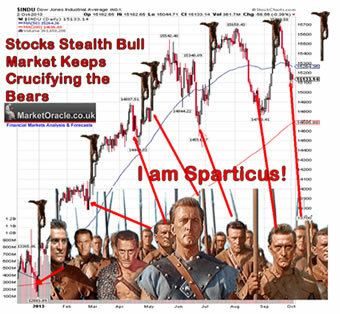 21 Feb 2012 - Stocks Stealth Bull Market Riding Tsunami's of Debt Crisis Fears to New Highs, What's Next? As I have pointed out over a 100 times now, the strategy for a bull market is VERY simple! It is this - "The greater the deviation from the stock market high then the greater the buying opportunity presented." No black box top secret program, no need to subscribe to a flip flopping newsletter commentary service that is most bearish at market bottoms and most bullish just before markets top out and then suffers amnesia as to what was actually written which ultimately means converging towards writing weak conclusions that could imply any eventuality. The bottom line is that by referring to the past and focusing on the future, all that is going it happen is that you are going to get all worked up and frustrated when what you need to do is practice perceiving the PRESENT, for that is where ALL decisions are made. 13 Sep 2013 - Army of Estate Agents Recruited for UK House Prices Boom, Election May 2014? 10 Sep 2013 - Final Warning UK House Prices Boom Imminent! 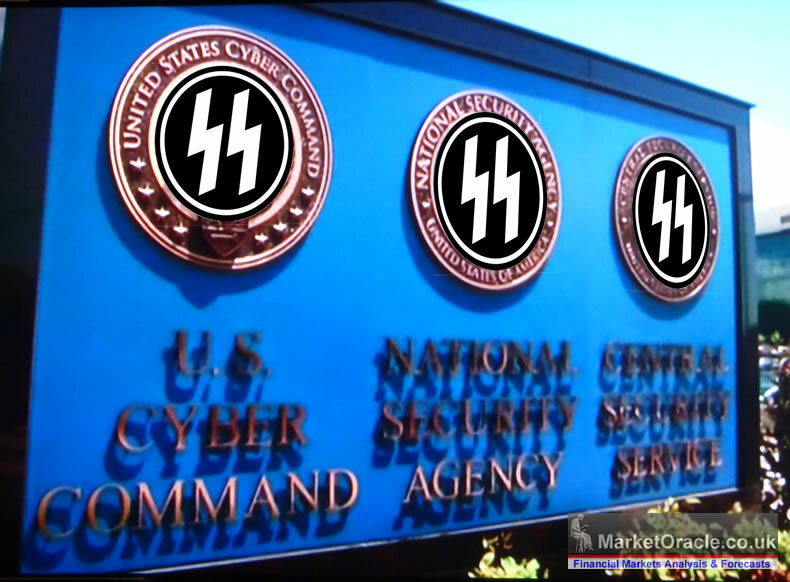 Obama to the peoples of the world "Yes We Scan"
NSA - "Angela Merkel could be a terrorist". Why worry? If you have nothing to hide then you have nothing to fear?